The Usuda Deep Space Center is temporarily closed due to the road conditions. 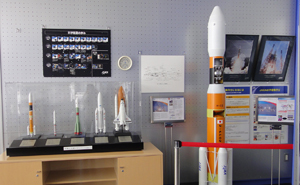 The Usuda Deep Space Center was established in Usuda Town, Minami-saku, Nagano Prefecture (Saku City from April 2005), in 1984, as an affiliated space center of the Institute of Space and Astronautical Science (ISAS). The Center conducts command transmission operations to deep space probes and receives observation data from them as they fly closer to satellites, planets, comets, and the moon. The remote location of the Center was chosen carefully to avoid radio wave interference by reducing noise from towns and air routes allowing for the reception of faint and subtle signals from deep space. The main facility is a large parabolic antenna whose primary mirror’s diameter is 64 meters and total weight is 2,000 tons. X-band and S-band radio waves are used for communicating with space probes. 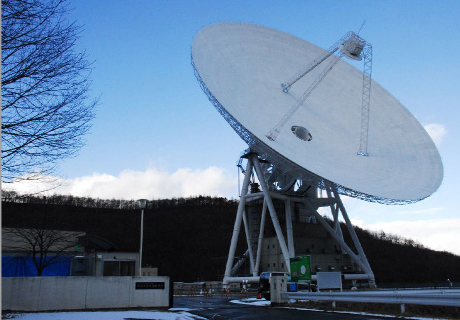 K-band will also be used in the future. In addition to the Center, a similar large antenna for tracking and controlling space probes is possessed by other overseas space organizations including NASA of the U.S.A. and ESA of Europe. Wheel chairs and baby strollers can enter the exhibition hall. No pets are allowed to enter the exhibition hall except a seeing-eye dog or a service dog. 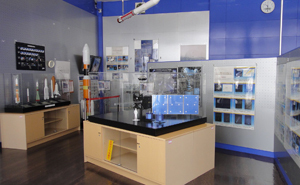 The Usuda Center offers an introduction to the antenna system and also has a 5.5 billionths-scale model of the solar system displayed along the route between the entrance of the Center and the other buildings. Remember that the distance between Tokyo and Osaka is only 0.1mm according to the model measurement. Enjoy a tour of the solar system on foot. Katsuura Tracking & Communications Sta. Masuda Tracking & Communications Sta. Okinawa Tracking & Communications Sta.